Don't forget that the new ticket price changes on the London Underground, Overground, DLR, buses and trams come into effect from Sunday 2nd January. 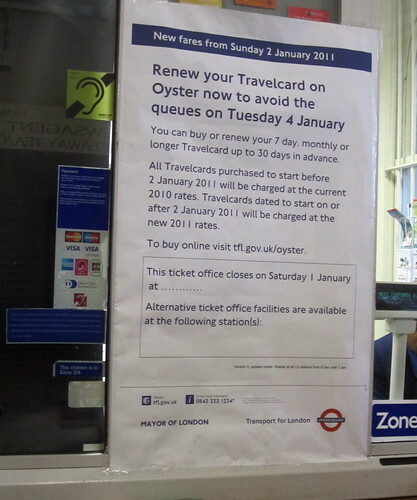 So buy your Travelcard before then to avoid paying the increases. Here's a quick summary of the main points, my post from October when the fare changes were announced goes into more detail. * The refundable deposit on a new Oyster card increases from £3 to £5. * A Visitor Oyster card will cost £3. * Anytime zones 1-3, 1-5 and 2-6 Day Travelcards and the Off-Peak zones 2-6 Travelcards are being withdrawn. If you don't touch in and out on the Tube, London Overground, DLR & National Rail, you may be charged a maximum Oyster fare of up to £7.40. TfL have the full fare guide for 2011 on their site.